Every garden is different and the lawn in it should be maintained in perfect condition which can be achieved by regular and proper mowing. 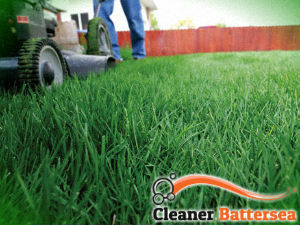 We have the manpower, machines and experience for providing effective grass cutting in the Battersea and nearby areas. You can count on our certified and hard-working gardeners who can come to your lawn once a week, fortnightly or whenever it is necessary to cut the grass and shape it in nice striped pattern. This will ensure its density and the good appearance of your property’s outdoor areas. You can rely on the gardeners who work in our company to restore the well shaped and attractive state of your lawn. Regardless of its size, condition and how overgrown it may have become, they have the skills and use powerful and modern mowers for the purpose. Some lawns may require once per week cutting, other more or less frequently done. You can save you free time for better things to do and use the professional grass cutting services provided by our company in SW11 every day in the week. Our gardeners will cut accordingly around the other plants in the lawn, pathways and other features. They can come to your property once in the week, fortnightly or whenever you need their services to cut and shape the grass. If it is too overgrown it may take them longer, but the work will be provided effectively and your lawn will be perfectly shaped. 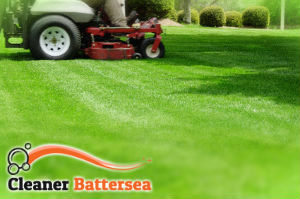 Our grass cutting services we offer in the Battersea, SW11 area and in the nearby boroughs at reasonable prices. Use them on a regular basis or one-off according to your needs.